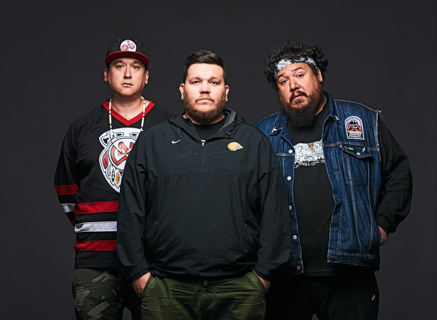 Formed in 2008, Canadian electronic music group A Tribe Called Red (ATCR) is made up of three Indigenous DJs: DJ NDN, Bear Witness and 2oolman. The group produces a unique style of music that is now being called “pow-wow step.” Their music combines elements of electronic music and hip-hop with traditional Indigenous drum beats and vocals. On Sept. 16, ATCR released their third album, We Are The Halluci Nation, and it is by far their most dynamic, political, and thought-provoking album yet. The musical trio explores the brutal history of colonialism throughout the album, all while maintaining a sense of hope for the future and change. We Are The Halluci Nation delivers danceable, infectious tracks that incorporate elements of dancehall, hip-hop, Indigineous electronic dance music. It is laced with meaningful lyrics sung over pulsating drum beats and unique sound combinations. The featured artists add their own touch to each track without resorting to mainstream tinny vocals. The album features international and local artists such as hip hop artist Yasiin Bey (formerly known as Mos Def), Columbian visual artist and musician Lido Pimienta, the late Native American poet and musician John Trudell, drum group Black Bear, and Inuk throat singer Tanya Tagaq amongst others. Collectively, these artists make this album a solid-sounding body of work that blends electronic production with traditional pow-wow instrumentation and modern hip hop. We Are The Halluci Nation opens with the hypnotic title track featuring Trudell, who introduces listeners to the Halluci Nation and what they represent. The Halluci Nation is evoked throughout the album, calling those who want to come together in the spirit of resistance against colonialism and capitalism and in the spirit of love for one another. The album features interludes of phone calls from a man trapped in Alie Nation correctional facility, voiced by Joseph Boyden, author of The Orenda, offering a glimpse into the oral history of the impact of residential schools and poverty on the Indigenous community. The first single of the album, “R. E. D.,” features Bey and Narcy, who rap striking lyrics over intense instrumentals and singing by Black Bear. Narcy’s lyric “Coca-Cola soul controller holy waters” highlights the song’s themes of commodification, spirituality, and their intersection. As a signature of ATCR’s music, the iconic Indigenous drum beats and vocals are pervasive throughout the whole album. This is prevalent in Tanya Tagaq’s featured spot on “Sila.” ATCR integrates Tagaq’s Inuit throat singing into the track to make it sound like another layer of instrumentals at times and vocals at others. Nevertheless, there are more mellow and soft-sounding tracks on the album as well, such as “The Light,” featuring Lido Pimienta, and “Eanan,” featuring Maxida Märak. On We Are The Halluci Nation, ATCR showcases their musical prowess as the album goes from intense spoken word over drum beats, to dance music, to contemplative, more mellow electronica, all tied together by the philosophy and innovative style that has become synonymous with ATCR. We Are The Halluci Nation offers protest through music. It is a showcase of Indigenous talent. At times the lyrics may prove hard to swallow – cue Joseph Boyden’s interludes about harrowing experiences in residential schools. However hard to swallow, these words need to be heard. We Are The Halluci Nation manages to be equally danceable and thought-provoking. Despite being politically inspired, it also stands its own ground musically as a thoroughly enjoyable album to listen to.